California's Clean Vehicle Rebate Project (CVRP) is an additional purchase incentives for zero emission (all electric or fuel cell) vehicles, plug-in hybrid vehicles, and zero emission motorcycles. The project recently released data for uptake of these vehicles between March 2010 and December 2012. The data shows that over half of qualifying clean vehicle purchases were for all electric vehicles. The program covers zero emission freeway capable vehicles (ZEV's; all electric or fuel cell), plug-in hybrid vehicles (PHEV), neighborhood electric vehicles (NEV), and zero emission motorcycles (ZEM). The ZEV's have a maximum rebate of $2,500, the PHEV's a maximum rebate of $1,500, the NEV's a maximum rebate of $900, and the ZEM's a maximum rebate of $900. There's also a rebate available for zero emission commercial vehicles (CZEV) that is now administered through the Hybrid Voucher Incentive Program (HVIP). Finally, there is a smaller per-vehicle rebate available for car sharing or car rental fleets. Applicants must be a purchaser or lessee of a new vehicle, and retain ownership, in California, for 36 months. The California rebate does add onto the Federal tax credits for these vehicles. The figures show a grand total of 15,750 rebates have been given in California. Of those, 8,168 were ZEV's, 7,327 were PHEV's, 49 were commercial ZEV's, 120 were ZEM's, and 86 were NEV's. The ZEV rebates cost $24 million, PHEV's cost $11 million, CZEV cost $980k, ZEM's cost $134k and NEV's cost $100k. The figures for the 9-county Bay Area are 5,584 total including 3,364 ZEVs for over $10M and 2,131 PHEVs for nearly $3.2M. The figures for the South Coast (Los Angeles basin) were 6,554 total including 2,467 ZEVs and 3,978 PHEVs. Those two regions accounted for 12,138 rebates out of the 15,750 total. The Chevy Volts did not qualify for the CVRP until Feb 2012, and approximately 2,300 Volts were sold in California before that date. 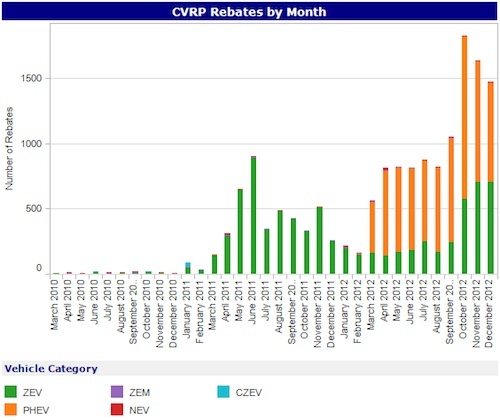 The last three months of 2012 show a marked increase in sales, with over 500 ZEV, and over 1500 total, rebates per month. The most active month for ZEV's was June 2011, with almost a thousand rebates granted. How much was this of national electrified vehicle sales? According to the Electric Drive Transportation Association, 2011 sales were 7,671 ZEV's and 10,064 PHEV's, and in 2012 sales were 11,547 ZEV's and 33,619 PHEV's. That's 62,901 plug-in vehicles total, of which 15,750 were in California according to CVRP's figures. EDTA's figures also show an increase in sales from September to November 2012 (they haven't reported on December), with both PHEV and ZEV sales jumping beginning in August 2012 while hybrid vehicle sales did not jump appreciably in the same period. EDTA shows 1,708 ZEV's sold in June 2011, the month California sold nearly 1000, and that was eclipsed in October and November 2012 with sales of 2,040 ZEV's in October and 2,211 ZEV's in November.